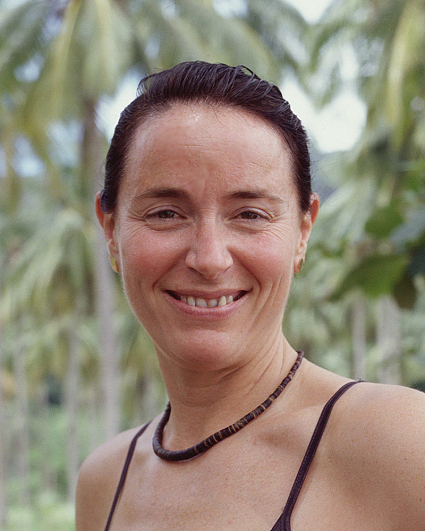 Born in Honolulu, Hawaii, Helen Glover is the daughter of a U.S. Marine and moved almost every year while growing up. She has lived in Hawaii, Virginia, Arkansas, North Carolina, California, Louisiana, and Rhode Island. Helen is currently employed by the U.S. Navy as a water survival instructor. She previously worked as a self-employed caterer, a waitress and a lifeguard. She describes herself as assertive, competitive and quick-witted. She enjoys cooking/baking, swimming and traveling. Her perfect trip would begin with breakfast in Honolulu, followed by shopping in New York, tea in London, a stroll along the Champs Elysées in Paris and watching a play in an amphitheater in Athens, Greece. Helen currently lives in Middletown, Rhode Island, with her husband, Jim, and their daughter, Katherine (18). She has two additional children, Matthew (28), a Captain in the U.S. Marine Corps, and stepdaughter, Erin (30). They have a tabby cat named Oscar. Her birth date is April 28, 1955.